Active Ingredient - Purpose. 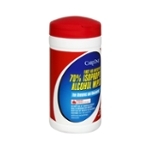 Isopropyl Alcohol 70% - First Aid Antiseptic. Inactive Ingredient: Purified Water. Warning: Flammable - Keep Away From Heat, Spark, Electrical, Fire Or Flame. Do Not Use If Tamper-evident Seal Is Missing Or Broken. Keep Out Of Reach Of Children. Caution: See Side Panel For Additional Precautionary Statements. Warnings: For External Use Only. Flammable: Keep Away From Fire Or Flame, Heat, Spark, Electrical. Ask A Doctor Before Use If You Have Deep Or Puncture Wounds, Animal Bites Or Serious Burns. When Using This Product: Do Not Get In Eyes. Do Not Apply Over Large Areas Of The Body. Do Not Use Longer Than 1 Week Unless Directed By A Doctor. Stop Use And Ask A Doctor If: Condition Persists Or Gets Worse. Keep Out Of Reach Of Children. If Swallowed, Get Medical Help Or Contact A Poison Control Center Right Away.